Random Acts Is Headed To Chicago! 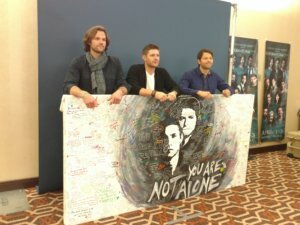 We’re headed to the Windy City for this year’s Official Supernatural Convention. Come help us #GetKind! Start packing those angel blades and plaid shirts now, because Random Acts is headed to Creation Entertainment’s Official Supernatural Convention in Chicago (#SPNCHI), and we’d love for you to come and say hello! Per tradition, our staffers will be onsite in the #SPNCHI vendors room from Friday July 14 to Sunday July 16, where they’ll be collecting donations for one of RA’s favorite local charities: the Heartland Animal Shelter. Looking to help out? Read on. 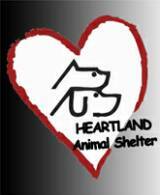 What is the Heartland Animal Shelter? The Heartland Animal Shelter of the greater Chicago area is a no-kill, humane 501(c)(3) organization dedicated to finding homeless pets forever homes while educating the public on the importance of spaying and neutering its pets in order to help with the pet overpopulation problem. Founded by Dr. Herbert Preiser in 2002, the shelter works to actively encourage adoption and offers its whiskered and tail-wagging tenants as much love, medical attention, and behavioral assistance as they might need. Currently, the shelter acts as a home for dozens of cats and dogs of all ages who are waiting for their turn to find a forever family. 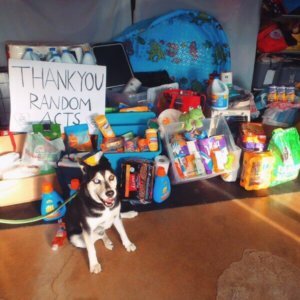 Over the past few years, Random Acts has helped fundraise for and collect car-loads of donations, all gifted by kindhearted supporters and “Supernatural” fans alike. This year, our staff is hoping to build on that foundation further. All donations can be dropped off at the Random Acts table and will be delivered to the shelter throughout the weekend as necessary. What if I can’t bring along any supplies? That’s OK too! We’ll be spending the convention weekend getting kind in other ways as well. Stop by the table when you have a moment and help us decorate fabric squares for blankets that will later be donated to nearby shelters. How can I find out more regarding Random Acts’ other projects? We’ll be available all weekend if you have any questions about our numerous programs and upcoming events; we’re also more than happy to provide you with details on the shelter itself. In the market for a new Random Acts button or pen? We’ll have plenty of swag to give away as well, so come by and say hi! Will I be able to meet Misha? Unfortunately, our co-founder is very busy and won’t be available for any photos, meet and greets, or autographs outside of his allotted convention schedule. If you’re looking for an autograph or photo, please make sure to check Creation’s social media pages and website for ticket sales and updates ahead of and during that weekend. We also ask that supporters direct any messages or gifts/items to the proper channels and not leave them at the Random Acts table, as space is rather limited. If you’re headed to the convention, we hope we’ll see you there! And if not? Follow along on Twitter (@RAFundraiser) or our other social media channels throughout that weekend—you can still be a part of our efforts to #GetKind!